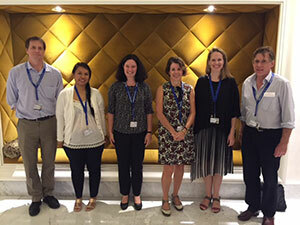 Some of the P4GES team organised a side event at the Convention of Biological Diversity meeting in Cancun, Mexico on the topic of 'Improving the evidence base on the effectiveness of forest conservation and rural livelihood initiatives in delivering social and ecological benefit'. I am currently attending the Conference of the Parties (COP) of the United Nation Convention on Biological Diversity in Cancun, Mexico, on behalf of the P4GES project. This is my first time attending the CBD meeting and I am really enjoying this unique opportunity. It is really interesting to learn how the policy process works, how decisions are taken, how the negotiations among country representatives and stakeholders are conducted, and how the decisions are made. It is a big opportunity to be part of all this meaningful and important process and to be able to share the results of our P4GES project with policy makers, practitioners and other stakeholders. 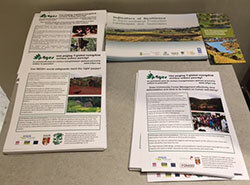 On December 12th the P4GES project ran a side event ‘Improving the evidence base on the effectiveness of forest conservation and rural livelihood initiatives in delivering social and ecological benefits’. The session was organized by Celia Harvey as part of the policy outreach of the P4GES project. I presented in this session the main findings of our survey of how local communities perceive the benefits and costs of small-scale livelihood projects in terms of both conservation and livelihood outcomes. Other speakers included Amy Duchelle from CIFOR, who spoke on the effectiveness of REDD+ in delivering conservation and livelihood outcomes, Phil Franks from IIED who spoke about the social impacts of protected areas, Dilys Roe (IIED) who spoke about the impacts of alternative livelihood projects on conservation outcomes. There was also an interesting presentation by William Dunbar (UNU) on indicators used to measure landscape resilience in ecological, economic and social dimensions. The session was very interesting and was well-attended. We had interesting discussions during the questions/answers session after the talks. Alexandra Rasoamanana (also from p4ges) helped with keeping time, taking photos and distributing the P4GES policy brief. It was a great opportunity to present our work but also to hear from other people around the world who are involved in rural livelihood initiatives linked to conservation. Most importantly, this event gave us the opportunity to share our results first-hand with the policy makers who make decisions about biodiversity conservation worldwide. View the presentations from the side event.